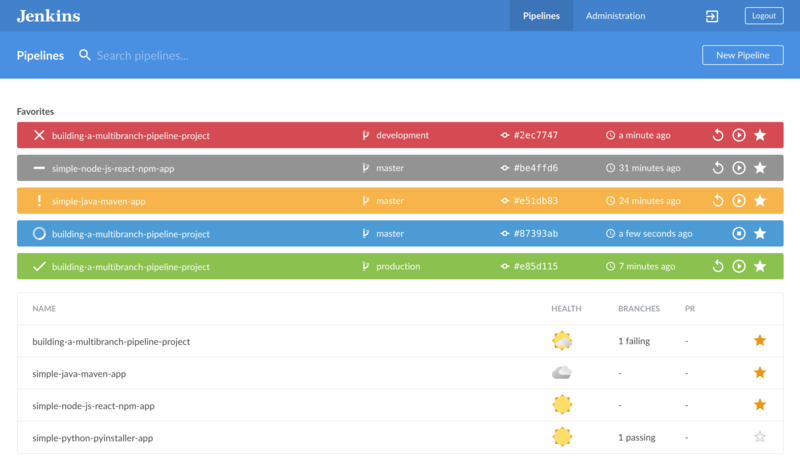 Blue Ocean’s "Dashboard" is the default view shown when you open Blue Ocean and shows an overview of all Pipeline projects configured on a Jenkins instance. The Dashboard consists of a blue navigation bar at the top, the Pipelines list, as well as the Favorites list. The Dashboard includes the blue-colored navigation bar along the top of the interface. This bar is divided into two sections - a common section along the top and a contextual section below. The contextual section changes depending on the current Blue Ocean page you are viewing. Search pipelines field, to filter the Pipelines list to show items containing the text you enter into this field. New Pipeline button, which begins the create a Pipeline process. The "Pipelines" list is the Dashboard’s default list and upon accessing Blue Ocean for the first time, this is the only list shown on the Dashboard. A star indicating whether or not the default/main branch of the item has been manually added to your current Jenkins user’s Favorites list. Removing the item’s default branch from this list (indicated by an outlined "☆"). Clicking on an item in the Pipelines list will display that item’s Activity View. The Favorites list appears above the Dashboard’s default Pipelines list when at least one Pipeline/item is present in your user’s Favorites list. This list provides key information and actions for a core subset of your user’s accessible items in the Pipelines list. This key information includes the current run status for an item and its repository’s branch, as well as other details about the item’s run, including the name of the branch, the initial part of the commit hash and the time of the last run. Items in this list also include clickable icons to run or re-run the item on the repository branch indicated. You should only add an item (or one of the repository’s specific branches) to your Favorites list if you need to examine that item’s branch on a regular basis. Adding an item’s specific branch to your Favorites list can be done through the item’s Activity View. Blue Ocean automatically adds branches or PRs to this list when a they contain a run that has changes authored by the current user. You can also manually remove items from your Favorites list by clicking on the solid "★" in this list. When the last item is removed from this list, the list is removed from the interface. Clicking on an item in the Favorites list will open the Pipeline run details for latest run on the repository branch or PR indicated. Blue Ocean represents the overall health of a Pipeline/item or one of its repository’s branches using weather icons, which change depending on the number of recent builds that have passed. Health icons on the Dashboard represent overall Pipeline health, whereas the health icons in the Branches tab of the Activity View represent the overall health for each branch. Blue Ocean represents the run status of a Pipeline/item or one of its repository’s branches using a consistent set of icons throughout.